Nestled behind the San Simeon campgrounds off Highway 1 is a collection of pipes humming gently with the flow of water. 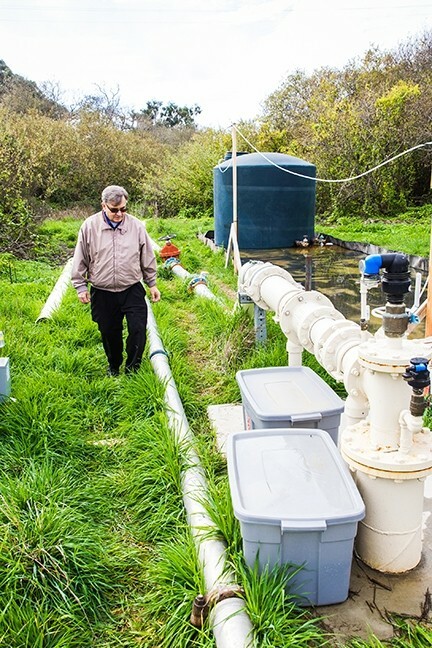 The system strips water of its impurities for the residents of Cambria—who can be rough and tumble in their views on the town’s water issues. Maybe the small community of 6,000 has always been outspoken about the issues that affect it, but that murmur built up to a roar after the Cambria Community Services District (CCSD) announced a stage 3 water shortage, setting a path toward the soft sounds that work away in near silence north of town. 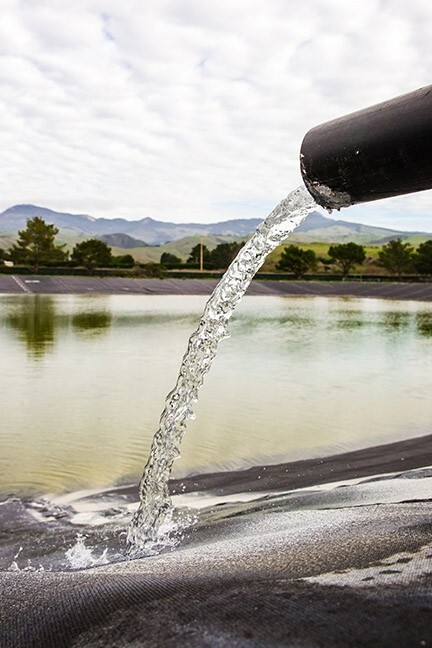 PURIFIED: After water has gone through the advanced treatment process of the Sustainable Water Facility, it falls into wells in the San Simeon and Santa Rosa Creek aquifers. In January 2014 Gov. Jerry Brown declared a drought state of emergency, shortly after which the CCSD upped the community’s declared level of water shortage. Doing so enabled the CCSD to take advantage of the governor’s order and create the Emergency Water Supply Project (eventually renamed the Sustainable Water Facility): a $9-million facility that runs brackish water through three stages of osmosis and injects that water into the San Simeon and Santa Rosa Creek aquifers in order to supply the community with additional potable water. 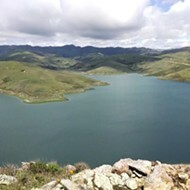 Because Cambria’s water deficit was categorized as an emergency, the project was approved under an emergency coastal development permit by San Luis Obispo County, bypassing the regular environmental review process. The plant was built first; the review process came after and still isn’t completed. At the time, Cambrians were already feeling the pinch, and many weren’t on board with the district’s decision. Residents were already using 40 percent less water than they had in 2013, and the CCSD had also restricted water units allowed per household and banned outdoor watering. 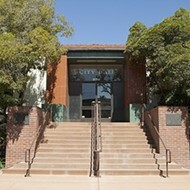 Some residents were concerned that the facility was designed to bring more development to town; some believed that Cambria had plenty of water; but many felt that the CCSD did a poor job of communicating enough information to the community. Former CCSD board President Gail Robinette sat in a chair facing her ocean view window as she calmly explained why the board took the actions it did. Robinette said the wells in the San Simeon and Santa Rosa Creek aquifers that supply the community were lower than they had ever been, and the CCSD felt it needed to do something about it. 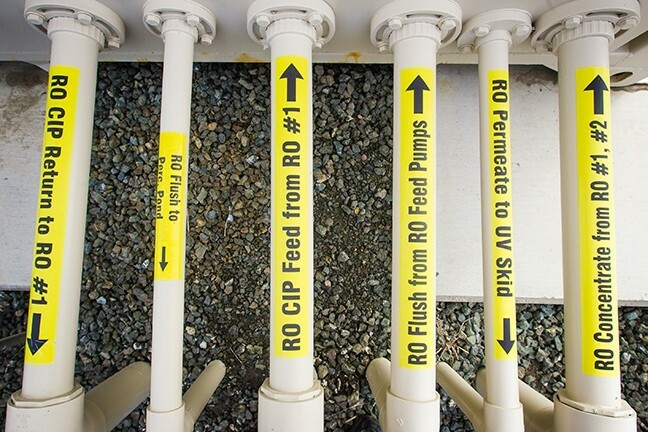 The CCSD had tested its wells’ supply levels between Dec. 9, 2013, and Jan. 24, 2014. The results showed that there were about 150 acre-feet left in both aquifers. That was only enough water to supply the community for about three more months, plus they faced the looming possibility of no significant rainfall in the future. As she sipped her coffee, Robinette talked about a statewide Office of Emergency Services training session she and former CCSD board vice president Mike Thompson attended. It addressed the issue of potential water loss for water purveyors across the state. Robinette learned that if water did indeed run dry in a community, people who stayed in their homes were considered to be a health violation—because there wouldn’t be water to flush the toilet or take a shower. “You know what happens next? They red tag your house, and until we do something to solve the water problem people can’t go back home,” she said. That potential scenario was enough to get the attention of Robinette and her board members, so they decided their next step was to meet with the U.S. Army Corps of Engineers. The CCSD had already been working with the U.S. Army Corps of Engineers for about 10 years, she said, to help brainstorm and study alternatives in case of a future lack of water. All of a sudden, that scenario was no longer in the future. 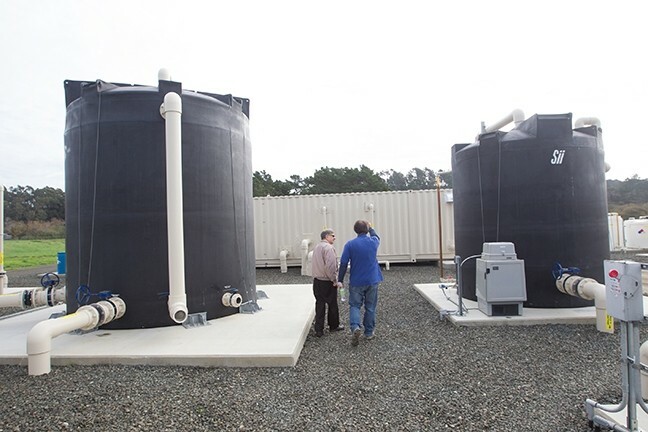 FLOWING: Cambria Community Services District engineer Bob Gresens explains what it takes to purify water enough to supply it as a community resource. In 2014 and 2015, Cambria wasn’t the only California town looking for water supply solutions amid the drought. In Carlsbad, a $1 billion plant was in the works to provide 50 million gallons a day to San Diego County, 7 percent of the area’s water supply. Santa Barbara was moving to reactivate a desalination plant that was closed for 23 years after being established in the ’80s and early ’90s. A $320 million desalination plant was in the works in Monterey County to serve 100,000 residents by 2019. Robinette pointed out the Santa Barbara plant because it was shut down after the county believed there wouldn’t be another drought and some of the plant’s parts were sold. But the drought had returned and persisted. 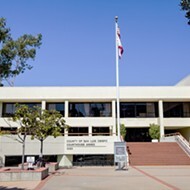 The city of Santa Barbara voted to reactivate the plant in 2015, costing an estimated $61 million to revive it on top of the $34 million cost for its initial construction. $9 million for a long-term facility in Cambria was logical. However, some Cambrians felt that the intentions for the emergency project to become a permanent fixture weren’t clear and believed it was just a temporary thing. “There were rumors—well, this was just supposed to be for an emergency,” she said. Robinette rebuts those with the first paragraphs of the emergency coastal development permit issued by SLO County, which states that after six months the CCSD needs to seek a permanent permit. The emergency permit was issued just to get the facility built and operational before the district’s well water supply could run dry. In order for the facility to continue to operate, the CCSD needed a permanent permit. “There’s just so many layers of information, and it’s difficult to get down to simple terms so that folks can understand,” he said. Kirstein is a single father who works during the day to provide for his two sons. He said he misses most of the 12:30 p.m. CCSD board meetings, but that the few meetings he has attended he’s unsatisfied with the way new information is communicated. It’s just thrown out there without any further discussion to clarify any questions the public might have. When Kirstein tries to catch up on any new information, sifting through the documents doesn’t help clarify anything either. The paperwork accompanying the project contains a lot of science and technical jargon that’s hard for the average person to digest. He said it’s even unclear if the facility is operating yet. 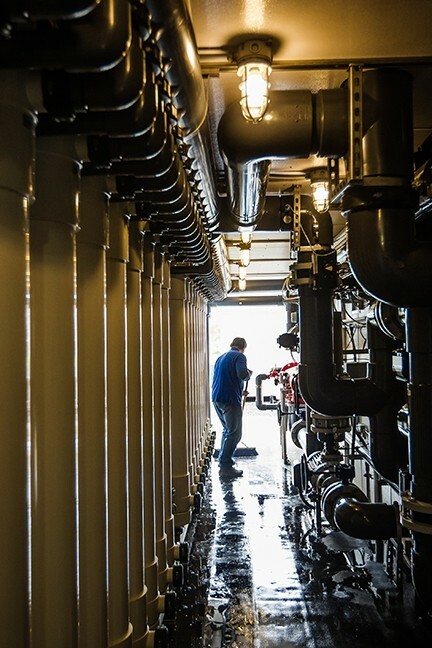 The facility is operational, but it still hasn’t met its mark, as the CCSD is finishing with a 60-day tracer test that tracks the flow of the treated water from the facility to the San Simeon and Santa Rosa wells. In the end, because the facility is there and the need for water is there, Kirstein just wants to see the board commit to making the facility work properly. There are residents who believe the facility is a necessity, and there are those who believe the opposite. Dewayne Lee is one of the Cambrians who believes the community has ample water supply without the facility. He ran for a seat on the district board in the recent election but lost, coming in fifth. “As it turns out we were not in the emergency that they declared,” he said of the CCSD’s 2014 stage-3 water shortage declaration. WITHIN: Inside one of three bungalows on the facility site next to San Simeon Campground is where most of the water purifying magic happens. District board member Greg Sanders confirmed that Cambria is still very much in a stage-3 shortage. Sanders said that what many don’t understand is that Cambria was able to sustain its water use in past years because the wells in the San Simeon and Santa Rosa creeks would replenish during the rainy season. The drought presented an issue: no water to replenish the wells. Lee said that he and other members in the community also have an issue with the “alternate” agenda that the CCSD has with the facility—promoting development. Changing the name of the project from emergency to sustainable solidified that thought in the minds of community members. But the CCSD isn’t in charge of that. SLO County issues building permits because Cambria is an unincorporated section of the county. And the accusation that the CCSD created the facility for development purposes doesn’t resonate with Sanders. The U.S. Environmental Protection Agency imposed a building restriction on Cambria in the ’80s, which limits growth and has nothing to do with the town’s current drought situation. No more than 125 houses could be built in a year, so people who wanted to build after that capacity was reached were put on a list. Although the list started in the mid-’80s, it was closed in 1991 and there are still people waiting to build today. “I think there’s a fear of any additional growth to make sure Cambria does not grow beyond its resource capacity,” Sanders said. In order to preserve the amount of building, Sanders said there’s also a build-out reduction program capping growth at 4,650 residential units. “The plant was not to pave the way for additional growth; the purpose was to resolve Cambria’s chronic water shortage problem,” Sanders said. District engineer Bob Gresens recently took New Times on a tour of the water-treatment facility. Three bungalows contain various pipes and processing equipment, eventually flowing water through pipes underground to help recharge the aquifers. IMPACT: The Sustainable Water Facility is small but complex—a bargain, according to the CCSD, when compared with its $9 million price tag. The CCSD sought the approval of an emergency coastal development permit by the county in 2014 to go around the initial review process, because providing water was the main priority at the time, Gresens said. An environmental group, LandWatch of San Luis Obispo, filed a lawsuit in collaboration with the Stanford Environmental Law Clinic that same year, questioning whether the project had been appropriately exempt from the normal environmental process. The group believed that the CCSD took advantage of the drought to obtain an emergency permit and go around the review process. On July 27, 2016, SLO County Superior Court Judge Ginger Garrett threw the lawsuit out. Gresens said the district followed the rules of the emergency permit and is now trying to obtain a permanent permit, for which they have to complete an environmental impact report (EIR). “We knew there was a lot of diversity of opinions on this, so we thought we’ll just take the most conservative environmental review course that you can come up with, which is the EIR,” Gresens said. The EIR came out in August 2016, and the district received about 200 comment letters from the public as well as three state agencies. The CCSD is in the process of reviewing the letters and creating a response to the comments. Although information about the project is out there, many community members still believe that the CCSD could have had more dialogue about the facility. This is something the comment letters submitted on the EIR made clear; many of them ask for further clarification. 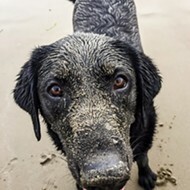 Tom Luster, senior environmental specialist for the California Coastal Commission, told New Times that the commission’s 15-page comment letter suggests the EIR be revised and clarified. Luster said the commission recently reached out to the CCSD to offer assistance with any questions it might have about the letter. “We offered to sit down with them and help clarify what we want or changes that they might be considering,” Luster said, but the district hasn’t responded. PROCESS: Creating potable water is complex and not always easy for the average person to understand, as the water takes many twists and turns through three stages of osmosis. That doesn’t surprise current CCSD board president and recently re-elected board member Amanda Rice. She said the board’s biggest weakness is communication. “It’s one of those challenges where we have to stop acting like we’re out here by ourselves, which to me, even being on the board, it feels like that’s kind of what we’re doing,” Rice said. It’s an issue not just with responding to agencies but with the community as well. She said it stems from the time constraint the board was under—and the tension that was felt—during and after the stage 3 declaration. She talked about a community that had concerns over a lack of water, the new facility and its impacts on the environment, as well as resistance to development. Some residents feel that the CCSD purposefully deceived the public, but that just isn’t true, according to Rice. Instead, it’s really about conversations that no one wanted to have publicly. She’s the only board member who said the CCSD has issues communicating with the public and also the lone member who said it’s something the district needs to work on moving forward. The lack of communication is a sentiment that one could say rang true in the recent election for three seats on the CCSD board. 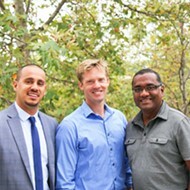 The community elected 30-year resident Harry Farmer, who campaigned to bring honesty and transparency to the community (of course, residents also re-elected two incumbents). Farmer declined to talk to New Times for this story, stating he wanted to have a better understanding of the facility once he’s sworn in and has access to the same information the board does. Lee, who believes Cambria has an ample water supply without the facility, said that Farmer is an honest person who will bring transparency to the board—but he’s just one vote. To Lee, the CCSD isn’t intentionally hiding information from the community, but its issues lie in how it chooses to operate.